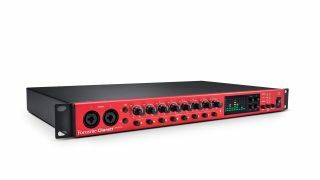 The What: Focusrite has launched the Clarett OctoPre, a new eightchannel mic pre with AD and DA conversion. The What Else: The Clarett OctoPre includes eight of the Clarett range’s Airenabled mic pres: the Air effect emulates the transformerbased sound of Focusrite’s ISA range of heritage mic pres. The preamps include extensive headroom, making them well suited for drums or other highlevel signals. The rear-panel inputs switch automatically between mic and line in, and there are also two instrument DI inputs on the front panel. The Air effect can be switched in or out on a channel basis and phantom power is also provided, switchable in two groups of four channels. Each channel features a balanced path from input to output plus a frontpanel switchable, electronically balanced, relaybypassed insert point allowing EQ, compression, or other analog processing to be left connected and brought into play with the push of a button. In addition to being fed to the AD converter, the input channels are also available at the analog outputs, from where they can, for example, be routed to a live mixing console while at the same time capturing the inputs digitally. The analog outputs, which appear on a rearpanel DB25 wired to the AES59 standard, can alternatively be switched to pick up the ADAT inputs via the DA converters. Focusrite has been making digital conversion systems for years, and the Clarett OctoPre provides a level of conversion quality that matches that of the mic pres themselves, with precision digital conversion offering 24bit operation at standard sample rates up to 192kHz. Both AD and DA converters measure a dynamic range of 118dB. Two ADAT input and two output ports are provided, allowing the Clarett OctoPre to carry eight channels of I/O at sample rates of up to 96kHz and four channels at 176.4/192kHz. The Clarett OctoPre syncs either to external ADAT or Word Clock, or may be clocked internally, and features JetPLL jitter elimination. Word Clock out is also provided. Metering is via a group of sixsegment LED bar meters plus perchannel clip indicators next to the channel level controls. Function buttons select insert and Air, and are used in conjunction with assign buttons under the channel level controls, plus two buttons selecting the front panel instrument inputs on channels one and two. The Bottom Line: Designed to allow the rapid addition of eight mic/line inputs and line outputs, Clarett Octopre integrates easily with the company’s Clarett range of audio interfaces, and other interfaces that include ADAT optical I/O. The Clarett OctoPre will be shipping in November and will carry a recommended retail price of $699.99.